Speakers need to have strong beliefs, lightly held. Yes, there’s contrast in that statement, but contrast is the beauty of performance. The job of a performer is to deliver a strong message while simultaneously being open to audience feedback. This is the tricky, two-sided nature of the job—one must possess the skills to provide both a powerful experience for the audience and a relatable openness during the socialization that occurs after a speech. On today’s episode of Steal the Show, we are joined Joey Coleman. For over a decade, Joey has helped organizations retain their best customers and turn them into raving fans through his entertaining and very actionable keynotes, workshops, and consulting projects. In this conversation, we unpack Joey’s Wall Street Journal bestseller, Never Lose A Customer Again. Joey provides insight for anyone trying to take their career to the next level. From the novice public speaker seeking his/her first paid gig to the amateur writer attempting to finish his/her first book, Joey’s insights will prove to be valuable. You can order Joey Coleman’s Never Lose A Customer Again here. Contrary to popular belief, not every relationship needs to be a long-term relationship. Usually the audience’s expectations are extremely low. The tactics speakers use to make themselves feel comfortable typically make the audience feel uncomfortable. Connection happens quicker when the people are at eye-level. Research shows that humans are afraid of those who are bigger than them. Figure out what the audience needs before stepping on stage, and deliver that to them. Listen to all of the speakers to hear what the audience has already heard. When giving a speech, recognize that it’s difficult to be in the audience. Many audience members need time to process the speech before asking questions. 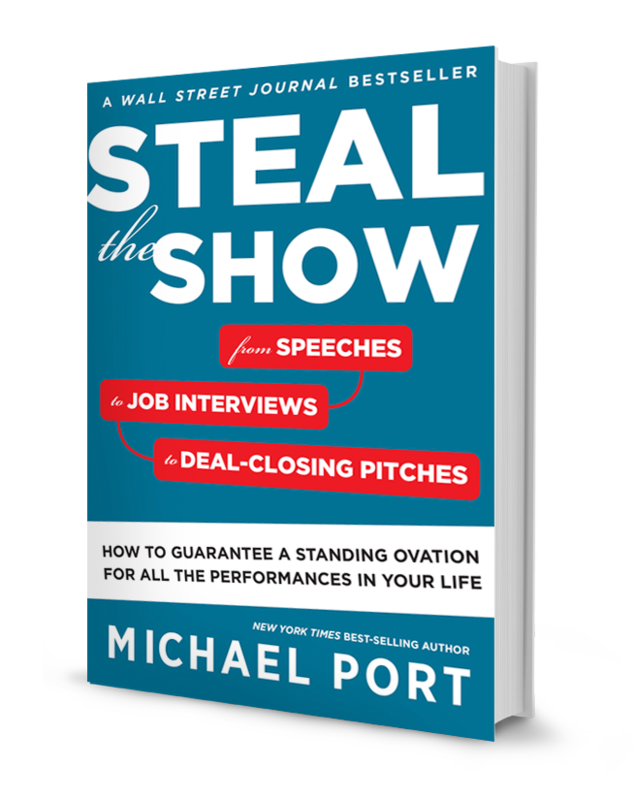 00:19 Michael Port: Welcome to Steal The Show, with Michael Port, a Heroic Public Speaking worldwide production. I’m your host, Michael Port, and today we are at Heroic Public Speaking Headquarters in Lambertville, New Jersey. It’s probably, from what we know, the only public speaking training facility of its kind. And today’s guest is Joey Coleman. When organisations like Hyde Hotels, NASA, Deloitte, The World Bank, and even Zappos, need to boost their customer experience, they call on Joey for assistance. Because for over a decade, Joey has helped organisations retain their best customers and turn them into raving fans through his entertaining and very actionable keynotes, workshops and consulting projects. His ‘First 100 Days’ methodology helps fuel successful customer experience endeavours at companies and organisations around the world. In fact, Joey’s recent book, ‘Never Lose A Customer Again’, is number two on the Wall Street Journal Bestseller List this week. Joey developed his narrative skills as a criminal defence trial attorney, he’s honed his communications and messaging skills at the White House, and he did things for the US Secret Service and the CIA that he can’t talk about publicly. And he’s also a member of the exclusive League Of Heroic Public Speakers. Ladies and gentlemen, please welcome Joey Coleman. 01:58 Joey Coleman: Hey! How are you doing, Michael? 01:59 Michael Port: I’m good! How are you? 02:01 Joey Coleman: I am great! Great! 02:02 Michael Port: You know, you look a little better than you did yesterday. 02:03 Joey Coleman: Thank you! 02:04 Michael Port: Joey’s been here with us for two days. I mentioned that he’s a member of the League Of Heroic Public Speakers and we’ve been spending a couple of days together. And you were really tired when you got here. 02:16 Joey Coleman: I felt like I had been running a marathon that kept getting longer, and finally it started to slow down. 02:25 Michael Port: And that, of course, was because of the book launch. 02:26 Joey Coleman: It was because of the book, yeah. 02:27 Michael Port: And we’re very excited, because before you got here, I did the intro and your bio, and I got to say, “Number two Wall Street Journal best seller”! 02:36 Joey Coleman: Number two Wall Street Journal! Very excited about that! Thank you to all the friends and fans, including you, obviously, who did an incredible job of helping me promote the book, share the book, get the book in front of people. It’s actually been quite lovely and humbling how many people came out of the woodwork to help with this. I’m just so appreciative and thankful. 03:28 Joey Coleman: You go get on a plane. And it’s over. 03:30 Michael Port: So, do you suggest trying to turn those more fleeting relationships into longer term relationships? And if so, how? 03:41 Joey Coleman: I think there’s a balance. Not every relationship needs to be a long term relationship. And I know that’s counter to how most people think about business, because they want everyone to become a referring client that continues to do business with them for years and years. And one of the things that’s interesting that I try to do, and I think all speakers should do – and I know this is a big message of yours and Amy’s – is, speakers get other speakers work. Right? And this is something that I strongly believe and I know you talk about it from an acting point of view, of how actors do that. And so, one of the things that I always try to do is, obviously, customise the presentation; deliver fantastic interaction with the client; follow up afterwards and share the feedback I get from the audience. And then I feed that information back to the host, so that they have a clear understanding of what their employees or their attendees took away from the conversation and what they’re planning to do with it. And what I’ve found is, the number of event planners and meeting planners and even in-house corporate folks, that are so appreciative of that. Because they’ve moved on to ‘time to plan the next event.’ And if I can help them with that process, not only do I get to help my friends, but it continues to establish me as someone who cares about them personally. 05:43 Michael Port: Do you ever get pushback? 05:44 Joey Coleman: From whom? 05:45 Michael Port: From the meeting planners or the people you worked with? 06:05 Michael Port: That’s a great analogy! That’s a really good analogy! 06:07 Joey Coleman: I appreciate that. I think with so many of these things around customer experience, we think that we have to do it for everyone, and we expect everyone to be blown away by it. If we truly put ourselves in other people’s shoes, we have no idea what they’re going through that day. They may have had a bad phone call, they may have a sick loved one, they may be dealing with any number of things that causes them to be short or not give you the attention that you’re trying to give them. And, as speakers – I say this respectfully – speakers are some of the most fragile people on the planet, right? This is the big misperception for audiences everywhere. I hate to break it to you, folks, right? But speakers are desperately seeking approval, as a general rule, sweeping stereotype here. And it’s like, “No, they may just actually have it under control.” Maybe there is another speaker they were planning to get this year, who couldn’t do the date, so they booked you, and now they’ve already booked that person for the next year. 07:21 Michael Port: Well, it’s interesting you mentioned approval. One of the things that we address, often, with our speakers is the difference between working for approval and working for results. And it’s very natural to work for approval, because, for whatever reason, we’ve set up this psycho-dynamic that exists between us and an audience and between us and the whole concept of public speaking, where we have this idea that we’re supposed to do some magical, epic thing, feat, experience that’s so big that it just blows people’s minds in such an extraordinary way that they’ve never seen anything like it before. So we’ve set those expectations so high, that then we get in there and we worry about whether we can meet those expectations. And when, in fact, the audience’s expectations are quite different. 08:16 Joey Coleman: Right. And, in fact, usually the audience’s expectations are extremely low. 08:21 Joey Coleman: That’s because there’s so many… much like the bar for customer experience, which I talked about in the book, is lying on the ground, the bar for the audience experience is usually lying on the ground. There are eight speakers that day, the first three went over time, they’re cranky, they’re forced to be there because their boss made them come to this conference, they’re feeling like they’re not getting the best food, they’re away from their loved ones. And next thing you know, “Please welcome to the stage,” you know, “Joey Coleman; Michael Port,” and you’re like, “Oh, great! So, I’m going to get to dig out, from this hole that you’re in emotionally,” it’s actually – and I don’t say this from a place of ego – it’s actually not that difficult. 08:59 Michael Port: Yeah. Well, that’s one of the reasons that I’ve always been a fan of yours is that you have this ability, I think, to key in on the most urgent needs that the audience has, and address those needs in a very practical – I don’t know what the legal term would be – but it does feel like your making a very sound legal argument to them. And I’ve always liked your approach so much, because you don’t seem like you’re trying to get any approval whatsoever from the audience but you have no chip on your shoulder. There are certainly words that would be completely inappropriate in any environment, and there are some environments where it is absolutely inappropriate, I spoke at a very large event for entrepreneurs who were Hasisdic Jews, and in the contract, absolutely no bad language. 10:24 Joey Coleman: A couple that come to mind immediately, because they’ve built their brand around that. 10:27 Michael Port: They’ve built their brand around it. And so someone said, “Do you think they intentionally build their brand around that in the beginning?” I said, “I have no idea.” I can never speak for anyone else. However, what I do know, having seen and worked with so many speakers over time, is that each on of us produces, often early in our career, some sort of protective way of being, some sort of layer that we sort of wrap ourselves up in or apply to our mind or our body, that just keeps us protected. 11:15 Joey Coleman: Right, yeah. But the audience, in that same instance, usually slides back in their chair, and they start to think, “Well, I don’t want to stand out. I don’t want to make eye contact,” they do all the things that, actually, most speakers [aren’t] looking for. They’re looking for the audience to lean forward in their chair, to keep eye contact, to be tracking with the emotional highs and lows of the presentation, and, to your point, the thing that the speaker is doing to make themselves feel better is actually going to have the opposite impact on the audience, which it has the potential to, which then, potentially leads that speaker to have to double down on what they’re doing, to feel more comfortable about the situation. And now we’ve got this situation where the speaker is just ramping things up higher and higher, while the audience is falling lower and lower and we’re never going to get in alignment, or it’s going to be very difficult to get in alignment at that point. 12:07 Michael Port: Yes, and we’re not speaking about anybody in particular. You know some of these people do those thinly veiled conversations about a person, this is not that, for anyone that would like to make it that. Please don’t, because it’s not. Have you ever reflected on that? Is there a particular thing that you have found that you do, or have done, that has been a kind of a way of protecting yourself, that maybe you’ve let go over the years? 12:48 Joey Coleman: Yes! I mean, there’s a couple of things. So, first of all, I love being a student of the human condition. I used to be a criminal defence lawyer, and it’s important to be able to read a jury, it’s important to be able to read a judge, it’s important to be able to read your client and see what’s going on. And I’ve worked in the intelligence community, which there’s plenty of reading of different scenarios, and worked as a business consultant, and now as a speaker, so I’m constantly trying to read other people and what they’re doing for their defence mechanisms. And by default, lots of times, the more we spend looking at other people, the more we realise that often they’re holding up a mirror. They’re holding up a mirror for us to understand ourselves. And the thing that drives you bonkers about someone, is usually something that you do. You do it in a slightly different way, and you explain and justify, in your own mind, often, that yours is better, or yours is different, or yours is not as egregious. But we’re all going through life, I think, or at least, let me rephrase that – because I know, when I’m talking to you, I try to be conscious of my absolutes – there’s some things I believe to be true of the human condition, right? And I think it is very rare that you meet a human being that is not, at some level, seeking to protect themselves, and seeking approval from the people they interact with. Now, to varying degrees obviously. Things that I’ve done, so, I’ll use humour to diffuse a situation, or to make myself feel better about a situation. Sometimes my posture. So, I’m 6ft2 – and I was recently having a conversation with a chiropractor about this – I will, when I’m talking to people, I will widen my stance and kind of drop my hip, to bring my eyes down closer to theirs. Now, some people would look at that and be like, “Why don’t you stand up straight? Why don’t you own who you are?” And it’s like, “Well, I do try to do that, when I’m on stage,” but when I’m off-stage, talking to someone, I try to be as close as I can to eye level. This is something I do, I learned this from my uncle, who’s an actor, one of the original founders of ‘Shakespeare In The Park’. Amazing guy. And one of the things I noticed at a very young age is, whenever he meets a child, he squats down and gets on the eye level with them, no matter who the kid is. and I’ve adopted that in my own life, and it’s amazing how much faster you connect with another human being when you’re at eye level. So, if you’re particularly tall, pay attention to that. If you’re particularly short, you might want to pay attention to that, too, right? And so, these are some of the little things that I’ve done that are really more around positioning and body language, but also being conscious of when I’m doing it and when I’m not doing it. 15:17 Michael Port: So, one of our clients is a fellow named Steve Smith, and he was an astronaut, a real astronaut. 15:26 Joey Coleman: A real, live astronaut! I love it! 15:28 Michael Port: But he’s retired, now, and I think he was at the space station four times, and has walked in space. There’s only two people, I think, two other US astronauts that have walked in space more than him. So he’s like that guy you see floating out on a tether. And he’s 6’3″, and we often have the kids here during events, because it’s a family business. 15:49 Joey Coleman: It’s a family business, of course. 15:54 Joey Coleman: The conference rooms here are named after the children. I mean, it’s truly a family business, I love it. And he was so present with her and it was just beautiful. And it was a reminder of how important it is, and not just when we’re talking to kids, but to get on the same level as everyone else. And that’s literally, and figuratively, of course. 16:48 Joey Coleman: Literally and figuratively, I totally agree. And one of the things that I’ve learned, the more that I become a speaker, so, I’ve been speaking my whole life. I was on the high school speech and debate team, I was a criminal defence lawyer, I was pitching business as a consultant. Now I’m on a stage, speaking. And, let’s stop and think about the actual set up of the room. Usually the stage is elevated. Usually the audience is seated. So, there’s automatically a significant difference in height. And what research on the human condition will tell us is, because we came out of caves and were nervous, that we’re afraid of people that are bigger than us. 17:24 Michael Port: That would make sense. 17:25 Joey Coleman: As a general rule, right? This is core, at a cellular level. So, to your point, when you’re on stage, yeah, you’re creating a moment of status, you’re holding the room. I believe you have a responsibility as the speaker to create an experience and create an environment. The second you come off-stage, your responsibility has changed. And I believe your responsibility, then, is to not be on a pedestal, to show them your humanity, to show them a level of connection, to show the audience members that you’re just a normal person. And , to be honest, if I may, I had a crazy experience. So, the book just came out and I did my first book signing. And I’ve got to tell you, it was amazing! It was so much fun, and you’ve been down this road many, many a time, but, for me, I was a rookie. I’d never had this experience. I spoke to fourteen hundred people, there was a line-up of people to sign books afterwards, that was two and a half hours long. 18:19 Michael Port: That’s incredible! That’s really incredible! 18:20 Joey Coleman: I was really appreciative that the audience lined up, and it was amazing! 18:24 Michael Port: That’s Oprah time. 18:25 Joey Coleman: Well, I don’t know if I would go that far. I don’t know if I would go that far. 18:27 Michael Port: I mean, at least Elizabeth Gilbert time. 18:29 Joey Coleman: Well, I appreciate that. I appreciate that. So, in that moment, I’m thinking, “I have a responsibility to maintain the energy of the crowd, through this book signing. Because people are standing in line, to get their book signed by me. The point of the story I wanted to share, though, is somebody came up to me and they said, “Hi! My name’s Joey,” and I said, “Oh! That’s awesome! My name’s Joey, too!” And she went, “No, no, my name’s Theresa. I’m sorry, I just…” and in that moment I realised she was so nervous about meeting me, that she misspoke, and introduced herself as me. I’ve been that person. I’ve been that person that’s so nervous, meeting someone that I admire, someone that I idolize, someone that I’ve put on a pedestal. Then, in that moment, I was like, “Oh, my gosh! I want to remember this interaction for the rest of my career, that it’s my job, as the speaker, to make everybody feel comfortable. To make them feel connection. 19:25 Michael Port: Yeah. So, let’s talk about that, because this is one of the reasons I brought up Steve Smith, is he knew what role to play in that moment, and I was wondering what role you play as your primary role when you show up to give speeches, and to work with clients. Have you thought about, “What’s my role?” Because you just articulated that you feel like it’s to make everyone safe, I think, if I heard correctly? 19:56 Joey Coleman: Yeah, to me, the role shifts, depending on the environment and the situation. Absolutely. 20:00 Michael Port: So, can you talk to them a little bit how of you see that, and your role? It would be great. 20:04 Joey Coleman: Yeah. So, I believe that every speaker has three audiences: you have the audience that’s in the crowd when you’re giving your speech; you have the meeting planner or the event co-ordinator, who managed the logistics of you being there; and then you have the hosting organisation – that’s the CEO or the board or the committee that picked you. And you need to be playing to all of those audiences. You also, obviously, have the audience of the AV team, you have many, many audiences. But lets talk specifically, if we may, about the audience that’s actually sitting in the crowd. There was a party the night before, so a lot of people didn’t even make the morning sessions. Now they groggily show up, they eat lunch, and then they come for a nap, I mean, my keynote presentation, right? In a room where they turn the lights down and they’re dark. So, in that moment I’m trying to read the energy of the room, I’m trying to read the content that I’m delivering, and the time of day that we’re at. 22:12 Michael Port: Did you change the opening at all in that particular situation? 22:15 Joey Coleman: I changed the opening by the energy. I still delivered the same content, but I probably notched up the energy of the story fifty percent. I really elevated it, in that setting, knowing what was happening. Now, had I come right – and this is, again, part of why I believe speakers should be in the room… Or, let me rephrase that. 22:42 Michael Port: Well, I should just refer to people who are not exactly sure why we keep laughing about that, is because I, probably ad nauseum, talk about doing our best to avoid generalities or absolutes. Because if use an absolute, then it often cuts off other perspectives. And it’s usually just habit that we use language that has absolutes in it, as opposed to being, I know Joey’s not closed-minded, he’s not closed to other points of view, it’s just language. 23:31 Michael Port: Yes! Exactly! 23:32 Joey Coleman: Because if we hold some truth. You know, I had a colleague recently who described it as ‘strong beliefs, lightly held’. 23:43 Michael Port: Yes. Beautiful. 23:44 Joey Coleman: Right? So, it’s okay to believe something very strongly, but don’t hold onto it so strongly. 23:49 Michael Port: Which I would imagine is a little bit different than the tack you need to take as a criminal defence attorney. 23:56 Michael Port: You don’t want to leave a lot of holes for the jury. 23:58 Joey Coleman: No, no, no! It needs to be absolute. And so I spent a part of my career being rewarded for, “there’s no chink in the armour,” and now I’m in a stage in my career where I’m actually rewarded for the vulnerability, for the ability to change the idea. 24:42 Joey Coleman: Right, I agree. I agree. 24:43 Michael Port: So, that’s why I try to move away from it. 24:46 Joey Coleman: But to get back to the point I was originally making before we went down this path, which I think is a really important path for us to consider. Part of the reason that I am a big fan, and one of the things I try to do as a speaker, is to be in the room for all the speeches before mine. 25:01 Michael Port: Yes! That’s unusual. Not a lot of speakers do that. 25:02 Joey Coleman: Not a lot of speakers, I’ve met, do that. And I do it for two very intentional purposes. One, that is audience serving, one that is self serving. The self serving piece is, I’m a lifelong learner, and so everybody who’s speaking, there’s something I can learn from them. Either from their content, or from the way they present, or for what I don’t want to do, if I see it, right? So there’s always take aways that I have from the speakers. But, more importantly, I want to be very clear on what the audience has heard. Many of us have had the experience of sitting in an audience, and hearing a presentation in the morning, and then hearing a presentation in the afternoon, where they use a similar case study, or maybe even the same case study, right? So, like in the world of customer experience, that I speak in, many people will talk about Zappos, right? I talk about Zappos from time to time. I don’t want to talk about Zappos, if the speaker before me did twenty-five minutes on Zappos. Or if I’m going to talk about Zappos, I want to make sure I’m talking about a different piece of that story that is not the common piece of the story, right? 26:07 Michael Port: Or you may want to link. 26:08 Joey Coleman: Or I may want to link, I may want to be able to say, “As you heard earlier, from Michael,” blah-blah-blah-blah-blah, “I totally agree with him,” which reinforces my fellow speaker, “And I’d like to take the discussion a little bit further and point out this, this and this,” and now I’m connecting the dots for the audience. I personally believe that some of the best speakers on the planet have that ability to piece things together for the audience. Because I think, as speakers, we often forget that it’s a challenge to be in the audience. We think it’s a challenge to be on stage. No, no, no, it’s a challenge to be in the audience. 26:42 Michael Port: Yeah. So, last weekend we had an event with our good friend, Marcus Sheridan. 26:48 Joey Coleman: The incomparable Marcus Sheridan. What an incredible, incredible human being. 26:51 Michael Port: They Ask, You Answer, Marcus Sheridan. 26:52 Joey Coleman: They Ask, You Answer. Marcus Sheridan. 26:54 Michael Port: And he did an incredible job. We did an event on video production and marketing, et cetera, and I watched the whole thing. It was the first time I sat in a room, watching speakers, but not interacting with them. Usually I’m all day long with speakers, coaching them. Just as a student, for the whole day, and I just kept thinking, throughout the whole thing, I said, “Thank God we spent so much money on these chairs.” Because they’re… so, do you know, I sat in, I think it was over forty chairs, before we chose the chairs for our theatre here? For the audience, for the attendee, for the student, for the client, for whoever he’s working with – something I admire about you. And I think that really is the getting in the shoes of the audience, right? So, you’re building a theatre, of course you’re going to test the chairs, the way you’re hard-wired. 28:05 Michael Port: Yeah, of course. 28:11 Michael Port: Because it’s not, as you said, an easy experience to be an audience member. First of all, you’re often in these uncomfortable chairs. Second of all, you might not like the temperature in the room. Someone else might like it. There is no perfect temperature. 28:23 Joey Coleman: Right. There’s is no perfect temperature. 28:25 Michael Port: I always just tell people, I want to do a really funny refund policy, like, “There are no refunds if you’re too hot or too cold, or too bright or too dark,” you know, or whatever, just these things that you just can’t get right for everybody. But, nonetheless, you can try, you can do your best to focus on it. Then it’s a long day, they’re often sitting next to people that they don’t know, which is not always relaxing, because you feel, “I have to ask questions, I have to say the right thing, and I’ve got to remember their name,” and, you know? And then, you’re trying to figure out all this new stuff that you have speaker after speaker after speaker, through a fire hose, just funnelling at you. 29:03 Joey Coleman: Exactly! Because, often, the event organisers think, “We’ll deliver more, which will make them value this event more. What I’m actually seeing in the market place with a number of events is, they’re having less speakers, and more free time. So, I think it’s an interesting thing even for meeting planners and event organisers to just think about is, where is the down time? Where is the free time? 30:17 Michael Port: Yes. So, we work with Guardian, and we’re going to Ireland this summer, to work with their top 100 producers. And it’s a big event that they do for the families of all of the top producers. And we’re going to be there for three days. Which is a long time, for us, for this kind of event. Because they got it! They get it! The whole afternoon is social activities, networking, connecting, so it is a destination experience, they do some professional development while they’re there, but we’re the only ones. So it’s, “This is what we’re going to focus on this year. Just this.” And it doesn’t overwhelm them. 31:16 Joey Coleman: Right. And this is part of the reason why it breaks my heart when I have to leave an event right after my speech. I know some speakers who love to just immediately have the car waiting, off to the next event. And what I always try to do, is stay. Because, what I’ve found, to your point about the example in Ireland with Guardian, is that audience members often feel more comfortable coming up and asking their questions a couple of hours after the speech, or the next day after the speech. 31:45 Michael Port: When they’ve had some time to think about the question. 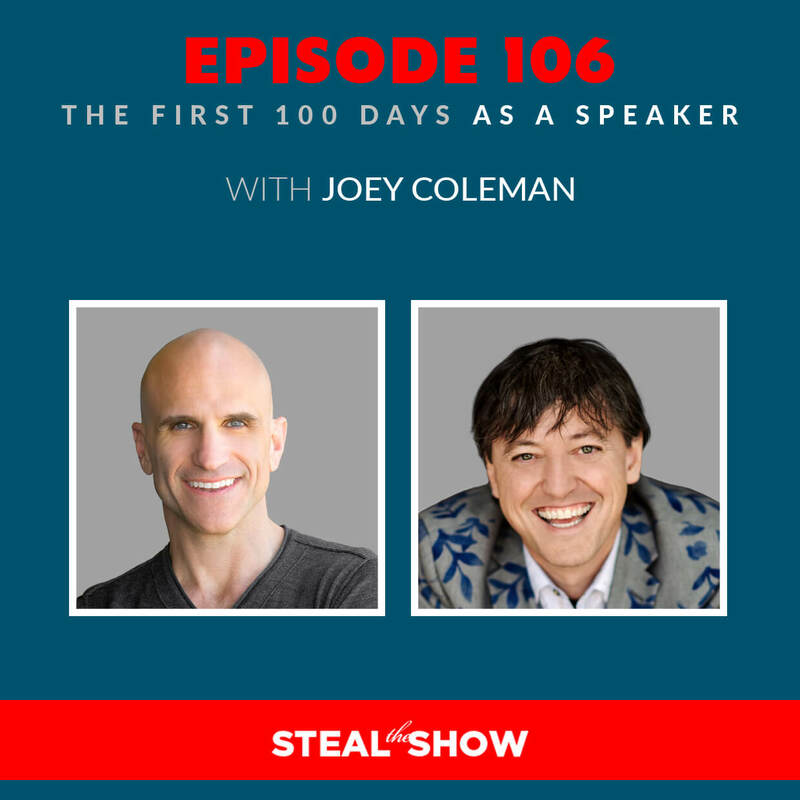 31:48 Joey Coleman: Exactly, where they’re allowed to process what they’ve just heard, think about the applicability to their business, and then they come up and say, “Hey, Joey, do you have a few minutes?” And I love those conversations. If you’re an audience member and you’re listening, come up to me. I love being able to have those type of connections and apply what we talked about on stage and in the book, to their actual lives. 32:08 Michael Port: Yeah. It’s not an easy thing to do, I think. To spend that much time at the number of conferences that you do. I think that’s why it’s unusual, because often you are skipping around from place to place to place. You’ve got to get out of there, but also, a lot of speakers aren’t extroverted, surprisingly. 32:40 Michael Port: Tell me if this is correct: I’ve seen you interact in groups, and, to me, you seem that you get energy from groups and from that kind of interaction. Where somebody else, when I’m around groups of people, it’s tiring, I have a harder time of it. So I have to work harder. So, is that accurate of you? Do you get energy from being around groups? 33:02 Joey Coleman: I do, but I also have recharge time. So it’s not a pure, 100% extrovert. I think Dan Pink would call it that I’m more of an ambivert, right? In the sense that I love the extroverted aspect of my life, and I live in a remote location in Colorado, twenty-five minutes from town. So, when I’m home, I’m there with my wife and my boys. Like, that’s it. Like, people ask, “Oh, I have a friend that lives in that town.” It’s a small town, like, 9,000 people, and they’re like, “I have a friend, do you know so-and-so?” And I always feel bad, I’m like, I literally know our landlord, and that’s basically it. And our closest neighbour, not even the neighbours that are a little further away. Because when I’m home, I’m home, I’m recharging, right? So that, when I’m at the event, when I’m on stage, I can amp up the energy and really feed off that. 33:51 Michael Port: What’s something that might surprise people that you have to continually work on as a speaker? 34:04 Joey Coleman: Couple of things come to mind. Number one, I get nervous before every speech. I think there’s a presumption because I’ve given thousands of speeches, that like, “Oh, yeah. He’s good with this.” Years ago, someone described to me that it’s not about not having butterflies in your stomach, it’s about getting them to fly in formation. So the butterflies in my stomach know that there is a set program, so when I start to feel them, it’s like, “Hey! Let’s get in the game! Focus! Get in line, you’re on lead, you’re drafting!” Everybody’s into action. There’s a great, great – we also talked about this, but I didn’t make the connection until last night – there’s a great TV series called ‘The West Wing’, which I absolutely love, written by Aaron Sorkin. And the lead character, who ironically enough was someone, Jet Bartlet, who had gone to Notre Dame, which is where I went to school, so I loved the show even more. Because I went to Notre Dame and I worked in the White House, so this show was magic to me. And it was also beautifully written and incredibly well acted. 35:50 Joey Coleman: Yeah, it’s something I work at. I mean, it’s where our conversation started, you know? You said, “Are you walking on air with the success of the book?” On one hand, yes, and I really tried that day, that I found out. So, I found out on a Friday that the previous week – because when they announce Wall Street Journal, they announce it the week after, so you sell books through the whole week and then the following Friday is when you find out – so I found out and I really tried to anchor into the moment of, “This is a fun accomplishment. This is something that a lot of people won’t do,” and not from a place of ‘I’m better than others’, just, this is rarified air. It’s like the story of your friend, Steve Smith, you know? He’s, like, an astronaut! There’s probably less than 500 people in the history of the world who have done something like that. 36:36 Michael Port: I think he said something like 18,000 people apply every year, and they take six. 36:39 Joey Coleman: Yeah! Yeah, it’s crazy, it’s crazy! But for him, it’s breathing. He’s been doing it. So, it’s trying to maintain that perspective of, “What I just did, or what I was able to accomplish, is something worthy of celebration, of taking time to note.” And, to be honest, it’s something I’m working to try to get better at. I mean, that’s probably another thing that people might not know, is that I am constantly trying to actually anchor in, the amazing thing… I mean, I feel an incredible sense of gratitude for the opportunities I’ve had, the friends that I’ve had, the incredible things I’ve been able to do. As it relates to things I’ve accomplished, categories you were putting in, I’m trying to figure out the balance between not resting on accolades, but celebrating accomplishments. 37:30 Michael Port: Good for you. 37:30 Joey Coleman: And it’s a work in progress. 37:32 Michael Port: Good for you. And what advice would you give to a new speaker, right at the beginning? They just say, maybe the don’t want to be professionals, but they want to speak all the time because they want to promote their business, or they have a message that they want to get out in the world. What do you want to tell them? 37:48 Joey Coleman: Sure. So, two things come to mind. Number one – which ties back to our conversation earlier about absolutes – there’s no right way to do this business. 37:57 Joey Coleman: There is no right way. You know what the right way to do this business is? The way that works for you. That is the right way to do this business. I’m very flattered. One of the first times that Michael and Amy invited me to speak at Heroic Public Speaking, I was kind of presented as the speaker who is earning what, to many people, seem to be big keynote fees, and didn’t have a website, didn’t have a trailer video, didn’t have a speaker kit. So the moral of the story is, I can point you to examples of people who started and were immediately giving five-figure speeches. I can give you examples of people that spoke for a decade, making less than a thousand dollars. If you want to measure your success by the dollars you make. I can give you examples of people that their first speech was to an audience of 10,000. I can give you examples of people who have been speaking for 20 years and have never spoken to an audience that big. 38:49 Michael Port: And that still had a successful career. 38:50 Joey Coleman: And that had an incredible successful career, right? So, find the metrics that work for you. If that’s dollars, okay. If that’s size of audience, okay. If that’s impact, okay. If it’s the length of speech, okay. You know, figure out what works for you. The second thing I would say is: speak. Give speeches. I believe that the number one thing we should be doing, as speakers, is trying to give speeches as often as we can, because every single speech is a treasure trove of feedback and information. To make you better, to help you understand your craft more, to help you hone your content more. Michael and I were talking the other day. This is true confession time. So, in the book, ‘Never Lose A Customer Again’, I talk about the eight phases of the customer journey. When I first started working with Michael and Amy – spoiler alert – there were seven. And, I’ll be honest with you – and I don’t know if we’ve ever talked about this – I went back to the hotel that night, and I was like, “I don’t know that this guy knows what he’s talking about.” You know? I’ve been working this content for years. How could it be missing? And the irony of all ironies, this ties it all together, the phase that I talk about is the ‘accomplish phase’. When you actually accomplish the goal. How do you help the customer celebrate it? Now, irony of all ironies, given my answer earlier, is it a wonder that I would be blind to that one? Since it’s something I struggle to do in my own life, to celebrate my own accomplishments. So, it makes sense that I would miss it in trying to teach it, because I miss it in my own life. So, go do what works for you, have fun, give speeches, because the more speeches you give the more opportunity you have to build your craft. 41:02 Michael Port: Beautiful! And, you know, if my ability to recognise that something was missing just comes from seeing the work. 41:10 Michael Port: You know, you’re showing me that it’s there in some way, that’s the reason I see it, and then you come up with it eventually. But that’s a testament to your character, to sit on something for three months and consider it, until you figure out which side you come down on. And then once you have it, you’re done, and you move on. 41:29 Michael Port: “What’s next?” Yeah! Exactly! Like Jet Bartlet. I’m actually, you know, a little trivia. I had, I think, four auditions for West Wing, when I was an actor, for the Rob Lowe character. 41:41 Joey Coleman: Lovely, lovely! Sam Seaborn, great character. 41:44 Michael Port: And, of course, they decided to go with the star, which happens. 41:47 Joey Coleman: They decided to go with a different star. 41:58 Joey Coleman: Lets go with someone we know. And that was such a powerhouse cast, I mean. 42:03 Michael Port: It was incredible. 42:03 Joey Coleman: Yeah, incredible. 42:04 Michael Port: And they did mix new actors with some stars, too. So, what’s a peak moment for you, as a speaker, when speaking? Like, what was a major, major moment that was very powerful for you, as a speaker? And what was a pit moment? What was something where you were pretty negatively affected by something, or down about something, or had a hard time, or bombed a speech? 42:30 Joey Coleman: Sure. Lets take the pit times first, so that we can try to reinforce that I need to get better about being happy about the things that have actually happened. So, I’d say the hardest thing, as a speaker, the bombing, you know, sure, there have been times that haven’t gone as well and there have been AV issues and there have been all kinds of things that happen. The hardest thing, is looking at the calendar and not seeing the next speech. That hurts. That hurts, as somebody who puts food on my family’s table, by giving speeches, to be sitting in a position where the next speech isn’t booked. So, the next revenue is unclear. It is terrifying and heartbreaking at the same time. So, that’s definitely the hardest part. And, invariably, in short order, suddenly there’s four speeches on the books. And so, it’s that faith, it’s that trust that if you’re doing the work, the opportunities will appear, right? Two stories about the highlights. So, I had been running a marketing and design firm, for over a decade, and started doing some speeches on the side, and I was thinking about going all in on this ‘first 100 days’ concept. So the idea that the first 100 days that a customer relationship is the most important, which is the core of the book, it’s the core of my speeches. But I wasn’t sure it was a good idea. Like, I thought it was a good idea, and I’d worked with clients for fifteen years, implementing these policies, so I had a lot of case studies of how it did work, and I still wasn’t sure, right? This is, in some ways, I think, often a speaker’s dilemma. We’re not really sure how good the idea is. We think it’s a good idea, but we want that audience feedback that it’s a good idea. And two good friends helped me out with this. A gentleman by the name of Yanik Silver, he used to run an event called, ‘The Underground’, and a gentleman by the name of Jayson Gaignard who runs Mastermind Talks. And Michael knows both these people, right? They both invited me to speak on their stage. And the way they ran their events, at that time, they don’t run them this way any more, is that everybody gave speeches, no one was paid, everybody spoke for free. And at the end of the event, the audience would vote, and the speaker would win a cash prize. And with Yanik, it was $10,000 to the charity of your choice, for Jayson it was a $20,000 prize. I was not really a paid speaker, I’d been paid for speeches, but they asked me to speak. And they both specifically said, and I forever appreciate and honour them for this, but, “You have to give the ‘first 100 days’ speech.” They were very insistent. And don’t you know it? The audience picked me. 45:39 Michael Port: Yeah, they did. 45:40 Joey Coleman: And I still didn’t believe it. I was very thankful, I was appreciative, it was amazing, I got to donate some money to an incredible charity and I was like, “Yeah, but maybe it was just because some of the other speakers weren’t as relevant to them, and maybe it was because I did this,” and I went into self-doubt, which I think is a space that speakers, many speakers, find themselves in. So, then I go to the next speech and it’s the same thing, we’re leading up to the speech and there are some big name speakers at this event, huge speakers that I really admire, New York Times bestsellers, you know, blah-blah-blah. Incredible folks, many of whom are great friends. And, same thing, I’m like, “If I win,” and I said this just to myself, right? “If I win, I won’t doubt again.” And as it turns out, once again the audience was kind enough to select me. I won. And I rode ‘not doubting’ for almost a full week. Almost an entire week, before I was like, “Well, I just don’t know,” right? And so, here’s the moral of the story, at least to me. Those were definitely highlights, amazing opportunities, but the way I’m hard-wired, which I’m working on, to be very clear, is that I always want to be learning, I always want to be improving. I never want to be the speaker, and I’ve had this experience of watching a speaker and hearing someone in the audience say, to their friend, just sitting next to them, “Oh, you know, he’s kind of past his prime. He shouldn’t, that content’s not really fresh any more, it’s not…” I never, that’s probably one of my biggest fears. My biggest fear, as a speaker, is that the audience goes, “Eh, we’ve heard this before,” or, “Eh, I’ve seen him speak before and there’s nothing new. That’s why every speech I give, I try to have something new in it. Every single one. Which is not a recipe for success for growing a business model, right? But does work for me. 47:39 Michael Port: What most people put… Some of my books, I’ve done more case studies than others and some books are not really case study type books, but one of the books I did, called, ‘Beyond Booked Solid’, which people were supposed to buy after they read ‘Book Yourself Solid’. 48:00 Michael Port: It didn’t work exactly as I planned, but nonetheless, I had eight case studies, you had forty-six. 48:06 Joey Coleman: Forty-six, yeah. Forty-six case studies. 48:07 Michael Port: Forty-six case studies, in one book, which is remarkable. And you do additional case studies in your speeches that aren’t even in your books. 48:14 Michael Port: So that’s, again, a testament to this concern that you have of, “I want to stay relevant. I want to do things that are new.” So, I just want to mention, and wrap up on this. You know, you said you won both of these and yet you still thought, “Am I enough?” or, “Is it enough?” or, “Do I have what it takes?” and, “Maybe they just like me because I wasn’t the famous one.” Or whatever it is. 48:44 Joey Coleman: Right, yeah, and I know, because of our work together and because of a lot of other things, I know things that you can do to make the audience like you. There are techniques, there are tricks, folks, to increase the likelihood of the audience liking you. And I incorporate those into my presentations, because my goal is to create the best experience for the audience. 49:03 Michael Port: Yeah, well, the thing I want to mention is that, sometimes, even when you win, you still doubt yourself. Even when you’re given a stage, you doubt yourself. So, if you don’t win, or don’t get the stage, that doesn’t give you the right to doubt yourself either. Do you see? 49:21 Joey Coleman: Right! One hundred percent! 49:22 Michael Port: Because it’s like, both sides, “Oh, if I win, I doubt myself, if I lose, I doubt myself,” you know, whatever it is. And I did that same event the following year, and the way we met is because Jayson was, like, “Hey! Talk to this guy Joey who won last year.” And I’m like, “What? Who?” I didn’t understand. 49:54 Michael Port: And I said, “Who’s Joey Coleman?” I had no idea. So, I remember I’m sitting on my boat, and I’m talking to you, and I’m like, “Okay, what is this thing?” I really didn’t get it. 50:04 Joey Coleman: And by the way, I’m in total shock, because I’ve been following Michael for years. I’ve read ‘Book Yourself Solid’, I’ve read [‘Beyond Booked Solid’], I’ve read the illustrated ‘Book Yourself Solid’, like, I’m a big fan of Michael and his work, and I’m like, “Wait, I’m going to be on the phone with Michael Port? I’ve never met Michael. This is going to be amazing!” right? 50:18 Michael Port: And we became friends, and then over time we became better friends. But I lost. I didn’t win. I probably wasn’t even in the top five. I have no idea where I was, and could you imagine if I left there and said, “I’m never speaking again, because I didn’t win.”? That would be insane! So, it’s just an opportunity for us to remember that our brain does all sorts of crazy stuff, whether we get a yes or a no. So, let’s just try to avoid that, if we can, and just focus on doing the work. Because I found over time, is, if I do the work going into a job, and I do what I planned on doing, then I feel successful. Because you can’t, I mean, doing better than you planned on doing is very difficult. That’s like trying, imagine, you got to rub your belly and genies are going to come out and, you know? You can certainly be less effective than your planning. So that’s always the concern. So, if I do what I planned and I put in the work, I can always be satisfied or proud that I did the work. Because that’s really the only litmus test that I can have some control over. Whether I’ve done the work. 51:39 Joey Coleman: Absolutely, you’ve put in the time. 51:40 Joey Coleman: You know, it’s funny, we started the conversation with the news about the book hitting the bestseller list. In the days leading up to that, I said to my team – because there were a number of friends who incredibly helped with the book, Clay Hebert, Elizabeth Marshall, Sarah Stibbets, my wife, Berrett, Tucker Max, all these great people who dramatically impacted on the success of the book, and I said to my team, “You know what, whether we make the list or not, we left it all on the field,” right? A sports analogy. We gave everything we could. There was nothing more that I felt we could have done, and so we’ve got to be happy with the results, whether the results are good, bad, or indifferent, we’ve got to be happy. 52:23 Michael Port: That’s right. I read a book called, ‘Work Rules’, by the head of People Operations for Google. And they give big bonuses to folks even when projects fail, sometimes. Do you remember that product that they produced, ‘Waver’, something. They produced this product, that when, it was supposed to be the big thing. I feel bad that I’m blanking on the name right now. Somebody listening is going, “It’s this! It’s this! It’s this!” They’re shouting it out. 52:59 Michael Port: I don’t know, I’ll look at the livestream and see. Everybody, what is it? Can’t remember what it was, but anyhow, huge, I mean, crazy money went into this huge team and it bombed. It was probably their biggest, I don’t want to use the word ‘failure’, but it was the thing they created that was the least adopted, least appreciated, it didn’t seem to work. But they still bonused those people for accomplishment, because they did something extraordinary. And you can’t always control the outcome. They did what they planned on doing and what they were asked to do. So, that’s got to be rewarded. Its got to be rewarded, because if you only reward yourself, or others, for the actual achievement of the objective, then your work becomes a zero-sub game. And you can be very proud of yourself for work you’ve done that didn’t get adopted very well. I’m proud of books, you know, some of my books have sold much better than others. I think that ‘s not unusual, that’s kind of normal. 54:12 Joey Coleman: This is the norm, yeah, exactly. 54:14 Michael Port: But, you can’t not be proud, I’m not ‘not proud’ of those books, that didn’t, you know? Doubt, I believe, is human. I think all humans doubt. The question is: To what degree? You know? And if we can minimise the doubt. And my buddy Ryan Holiday writes about Stoicism, right? And if you look at Stoic philosophy, it talks about, never be too excited, and never be too depressed. 55:34 Michael Port: Yeah. See, steady flow is a big part of lean production, lean management, that if your highs are too high, and your lows are too low, you often create waste. And so, what you’re doing, if you create a steady flow of work, then everybody who’s working on that work, feels steady. It’s one of the reasons that book launches are so difficult. It’s because that’s not a steady flow, that is blow your brains out for a period of time. 56:09 Joey Coleman: It’s a sprinting marathon. 56:10 Michael Port: It really is. It’s a sprinting marathon. 56:11 Joey Coleman: Imagine running a marathon, where you ran full speed as hard as you could. 56:16 Michael Port: And it was 30°. 56:17 Joey Coleman: And it was 30°. 56:18 Michael Port: And you have a head wind of 60mph. 56:30 Michael Port: Yes! That’s it! That’s a great analogy. 56:48 Michael Port: And we want to look at the long game. Look at where are we going? What do we want to produce? What steps are we going to take to get there? And we’re going to do it over time. 56:58 Michael Port: Joey Coleman! You’ve got a plane to catch! Thank you so much for being here. 57:02 Joey Coleman: Thank you, Michael. 57:02 Michael Port: I just adore you. 57:03 Joey Coleman: Oh, likewise, I appreciate it. Thanks so much! 57:05 Michael Port: And to everybody that’s on our livestream, it’s the first time we ever did this. 57:08 Joey Coleman: Whoo! Exciting! 57:09 Michael Port: And we’re going to have more of our guests coming into the studio to do our episodes. 57:14 Joey Coleman: It’s so much fun! 57:15 Michael Port: Which is just so much fun! And maybe we’ll keep putting it on the livestream, if you guys like it. Jane Wilson said it was gold. 57:23 Joey Coleman: Oh, Jane! You’re the best! Thank you! 57:25 Michael Port: Dave also said, “‘Find the metrics that work for you’, that’s gold.” There’s a lot of gold. 57:29 Joey Coleman: Nice! I love it, I love it! Yeah, you guys, you’re really super welcome! This was fun. 57:44 Joey Coleman: Thanks for joining us, friends! Appreciate it! Lots of familiar names there, appreciate you, too. 57:49 Michael Port: Alright, guys, we’ll see you later. Bye-bye! This podcast was produced by Laura Bernstein, our director of communications, with sound production and marketing by Colin Thomson and Kast Media. Music is mixed by Shammy Dee, and we recorded today’s episode at Heroic Public Speaking HQ, the only, as far as we know, public speaking facility of its kind. Special thanks to today’s guest, Joey Coleman, and to you, for listening and learning how to be a performer in your spotlight moments. 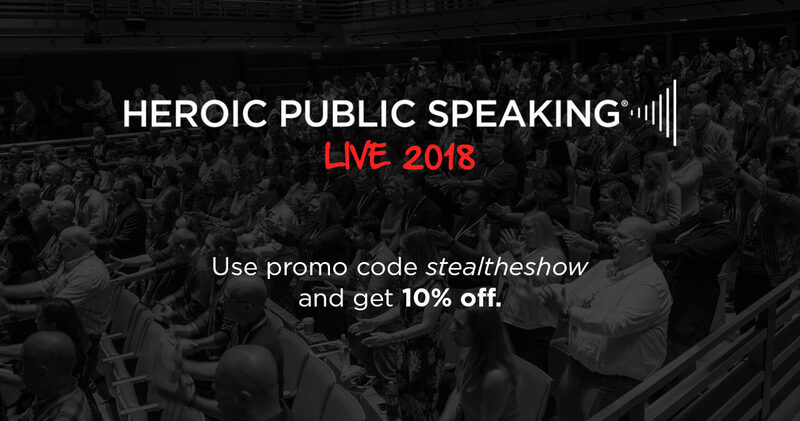 Make sure to reach out to us on Instagram and Facebook, @heroicpublicspeaking, and let us know what high stakes performances you are currently crushing. Like Ally, who said she listeeds to us as she started her brand new job. No, really, she had to listen to us, she’s my new assistant. But let us know your big performance achievements @heroicpublicspeaking. I can’t wait to hear from you. I love you. But not in a weird way. Bye for now.